Do you offer Wholesale or Qty discounts? How do I print a detailed Invoice? What forms of payment do you take for International orders? How do you ship to areas outside the U.S.A.? 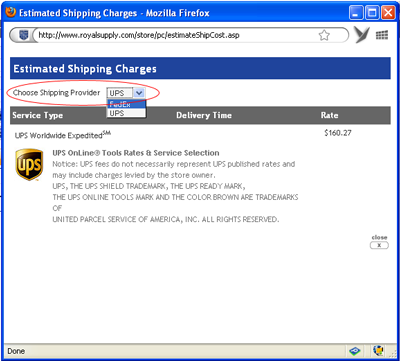 How do I Calculate Freight Charges? All orders should be placed online using a major credit card or PayPal at www.royalsupply.com. We do not accept credit card orders over the phone, fax, or email due to security and identity theft concerns. Yes, we accept wire transfers for orders that exceed $2,000.00. There is a $35.00 wire transfer fee for all wire transfers within the United States and a $50.00 wire transfer fee for all wire transfers outside of the United States. Yes, we offer Wholesale or Qty discounts on large quantity orders only. If you need a special quote for large quantity orders, please use the Quotation Request Page. For small quantity orders or single item orders, please use the prices found at www.royalsupply.com. To check the status of your order please go to the Login Page and login into your account using the email address and password you used to create your account. If you placed your order using the Guest Checkout then please go to the Login Page and enter your email address and your Order Code located at the bottom of your Order Received email (i.e. ORDER CODE: XVV9822379975) in the Order Review section. If you registered an account with www.royalsupply.com you can print a Detailed Invoice by going to the Login Page and logging into your account using the email address and password used to create your account. If you placed your order using the Guest Checkout then please go to the Login Page and enter your email address and your Order Code located at the bottom of your Order Received email (i.e. ORDER CODE: XVV9822379975) in the Order Review section. Once logged in, locate the Order# you would like to print out and click on the "More" button located on the right hand side of the corresponding Order#. From the dropdown, select "Order Details". Once in the Order Details page you may view and print a Printer-Friendly version or a pdf version. (all versions except Pocket Internet Explorer)Note To allow scripting on this Web site only, and to leave scripting disabled in the Internet zone, add this Web site to the Trusted sites zone. 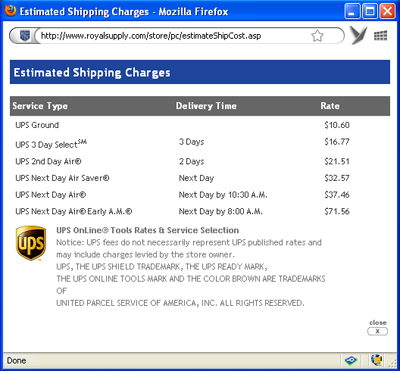 UPS 2nd Day Air Early A.m.
First add all your items to your shopping cart and then click view cart. Next, click on Estimated Shipping Charges. When the window pops up, put in your shipping information and click submit. It will show you Estimated Shipping Options and Prices. For International FedEx Rates please use the drop down box next to "Choose Shipping Provider" and select FedEx. If the drop down box does not appear, then the Shipping Provider does not ship to your location or there is incomplete information. You must fill in the Zip Code for this service to work properly. If your country does not use Zip Codes then use the name of the city in the Zip Code field as well as the City Field. Most orders are shipped within 3-5 business days Monday - Friday. Next Day Air and Second Day Air orders placed before 2:00PM EST Monday - Friday are usually shipped same day. Orders are usually processed the same day if the order is placed by 3:00 PM EST Monday - Friday. Please note, on small dollar orders and parts orders, shipments may have a longer lead time and delivery do to minimum requirements from our Vendors and Manufacturers. Rush Shipments include Next Day Air and Second Day Air orders. All Next Day Air and Second Day Air orders must be placed by 2:00PM EST in order to ship out the same day. Gates Industrial Power Transmission Belt Rush Shipments must be placed by 3:30PM EST in order to ship out the same day. We do ship Direct from most of our Manufacturers, but unfortunately not all orders can be shipped direct if we do not have the items in our warehouse. Below is a list of Regulations for Direct Shipments. Shipping expenses cannot be included in minimum order amounts, shipping expenses are in addition to minimum order amounts. Gates Power Transmission Belts: Orders on belts must be over $300.00. Next Day Air & Second Day Air orders must be over $100.00. 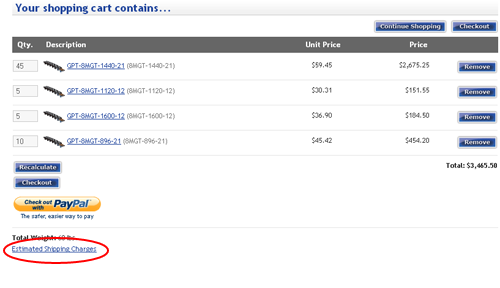 Wright Tool: Wright Tool orders must be over $200.00 for direct shipments including Second Day Air orders. Next Day Air orders Have a minimum order amount of $50.00. Ridgid Tool: We only ship Next Day Air and Second Day Air orders direct from Ridgid Tool. Krylon & Sprayon: Orders must be over $300.00 to direct Ship. Krylon and Sprayon orders cannot be shipped Next Day Air, Second Day Air, or any expedited air shipping service. BluMax Tools, Brennan, G&J Hall Tools, Hitachi Maxco (Senqcia), Laco, and Markal: Orders must be over $150.00 for direct shipments of any kind, including Next Day Air and Second Day Air orders. Coxreels: Most orders can be direct shipped, please call for availability. We do not ship International Orders directly from our manufacturers. The items must come into our main warehouse here in Ohio. Aerosols, Paints, and fluids can only be shipped via UPS Ground, they cannot be shipped via UPS Next Day Air, Second Day Air, or 3-Day due to shipping regulations. We also do not ship Aerosols, Paints, or Fluids Internationally. If shipping internationally, please set up your transportation method with a freight forwarder in the US which we can ship to or can pick up at our main warehouse in Ohio. For international orders we only accept Verified by Visa or MasterCard Securecode credit card programs or PayPal (The PayPal payment must have "Verified" status and the shipping address must have "Confirmed" status) Please contact PayPal on how to become Verified and Confirmed. We accept wire transfers for orders over $2000.00 plus a $50.00 wire transfer fee. We currently ship all International orders via USPS, UPS, or FedEx International. Please note the prices given by UPS, FedEx, & USPS may include Brokerage Fees but do not include possible fees for Duties and Taxes applied by Customs. For more information on Duties and Taxes, please contact your local Customs agency. Please note, depending on your shipping location, for reasons determined by UPS, FedEx, or USPS shipments may be delayed for reasons that Royal Supply cannot control. Please use the tracking number emailed you for shipment tracking information. If your package is delayed and cannot be tracked, please feel free to contact us at shipping@royalsupply.com. For UPS, if you are a European country, you can also use this link for approximate UPS European Transit times. Canadian orders fall under the same guidelines as International orders. Please note that the UPS Standard to Canada Shipping option does not include possible Brokerage Fees, Duties, and Taxes that may be applied by UPS when receiving your order. 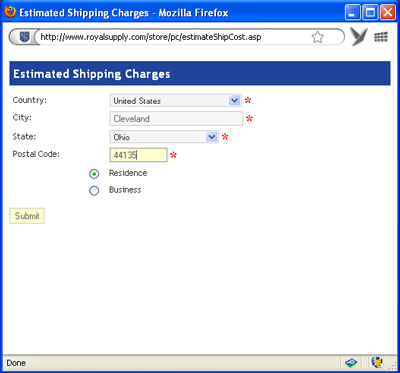 These charges are issued by UPS and are not associated with www.royalsupply.com. Please note, depending on your shipping location, for reasons determined by UPS, FedEx, or USPS shipments may be delayed for reasons that Royal Supply cannot control. Please use the tracking number emailed you for shipment tracking information. If your package is delayed and cannot be tracked, please feel free to contact us at shipping@royalsupply.com.